Hello hello dear friends! I hope everyone is having a wonderful extended weekend. Here in the States it's Memorial Day, where we gather with family and friends and honor fallen soldiers. Of course, there are pounds of burgers, hot dogs and potato salad consumed, too. :) Best wishes for a happy and safe Memorial Day to each of you. 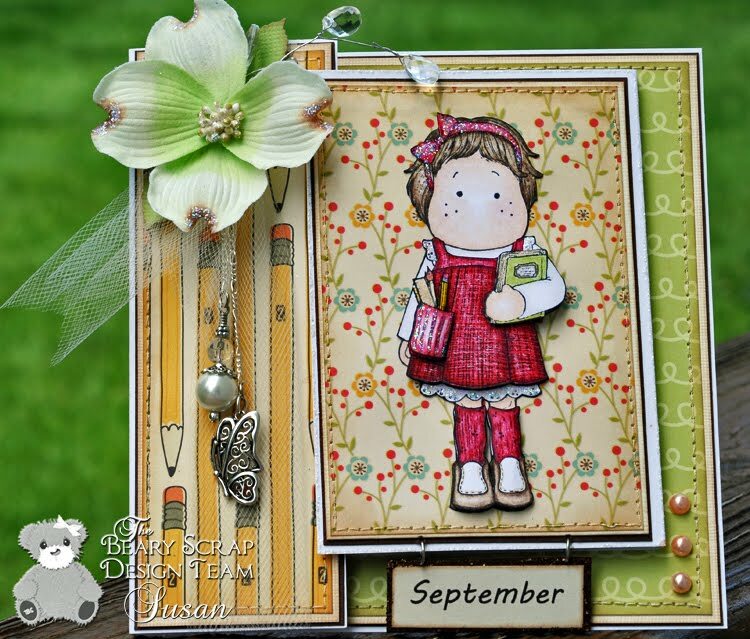 So it's Monday, which means I get to ring in a new week for the Beary Scrappy Girls and introduce our next design team challenge. This week we have a sketch challenge, designed by little ol' me. It's my first sketch and I think it turned out OK (if I do say so myself!). "Hello, my name is Susan, and I'm a Basic Grey Kioshi addict." Or so it seems, anyway! I can't get enough of the delightful patterns in this line of papers. Here I've used the larger 12 x 12 patterned paper for the background as well as the smaller 6 x 6 pattern paper. I love those itty bitty paper pads! 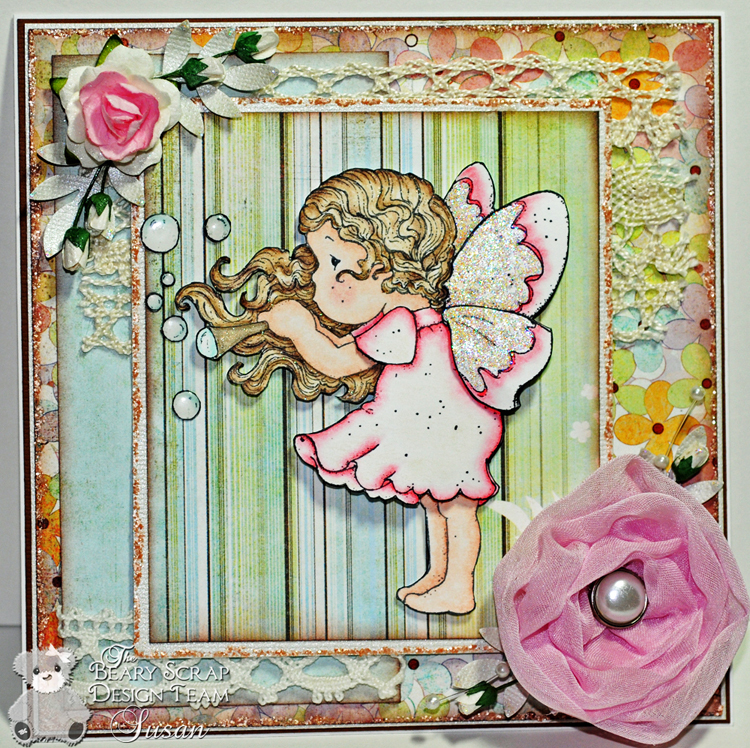 This little sweetheart is Bubbling Tilda, from Magnolia's Fairytale collection. I've layered her and cut out her bubbles. Her dress is lightly colored with cranberry and very pale yellow Prismacolor pencils. Her wings are colored with the same pencils and enhanced with Stickles. I used a Copic Spica pen to highlight random strands of her hair. Even though the sparkle is visible when I view this photo in Photoshop, it's washed out once uploaded to blogger. *sigh* That's what imagination is for, right? The big flower is hand made with a strip of chiffon and Fabri-Tac. Cool, huh? Thanks for stopping in! Tomorrow is a new Beary Sweet Challenge, so be sure to visit the Design Team blog for all the details. Don't forget that today is the last day to enter your project into our current challenge - Fancy Folds. You could win a Scor-Pal! 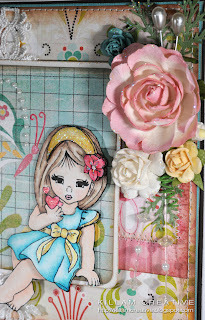 Oh, and if you're a blog candy kinda gal, today is the last day to enter my birthday blog candy. Good luck! TBS DT: No More Pencils, No More Books/Updated! 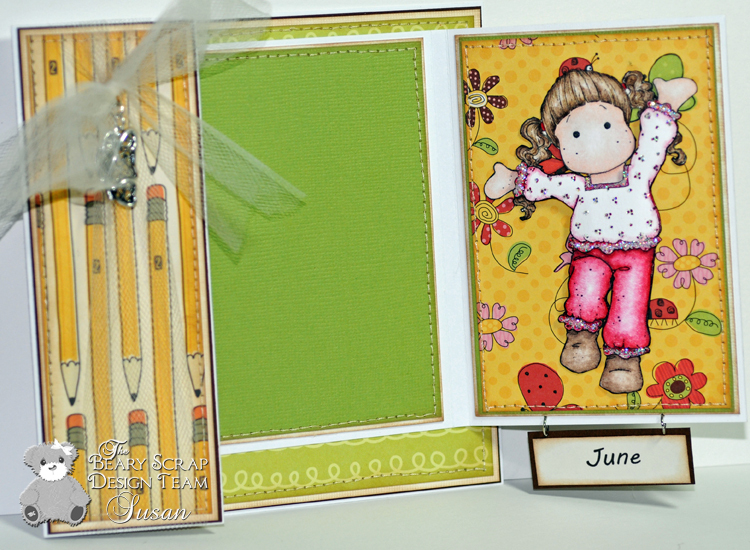 This week at The Beary Scrap, the DT's are celebrating that school-age feeling that comes around at the end of May. Remember how excited you were for summer? Ahh, the exhilaration as that last bell rang out the school year. No more pencils! No more books! No more teacher's dirty looks! The front Tilda (Tilda with Pencils) is layered 3 times - the top layer is the pocket and left arm with books. "Happy Tilda" on the inside is layered twice. The "reworking" includes the dogwood and crystal jewels, as well as changed-up charms: I added the chains and a homemade pearl bauble. I colored the pearls with a pink Copic on the front (as well as the butterfly trail on the inside). This is the first time I haven't used a white "signature"panel - I'm on the fence about the green (or more accurately, I'm unsure of *anything* but white.) Ah well, the sewing machine had it's way with that panel, so green it stays! Haha! How about that ladybug on Tilda's head? It's one of those unforseen quirks of homemade cards... right? I'm tempted to make it official and pop another ladybug on her head "for real". I added grass with Prismacolors, similar to the grass I did on this card. It's not quite as good as that Edwin card, but it gives enough of a hint of the grass she's frolicking in that I'm happy. 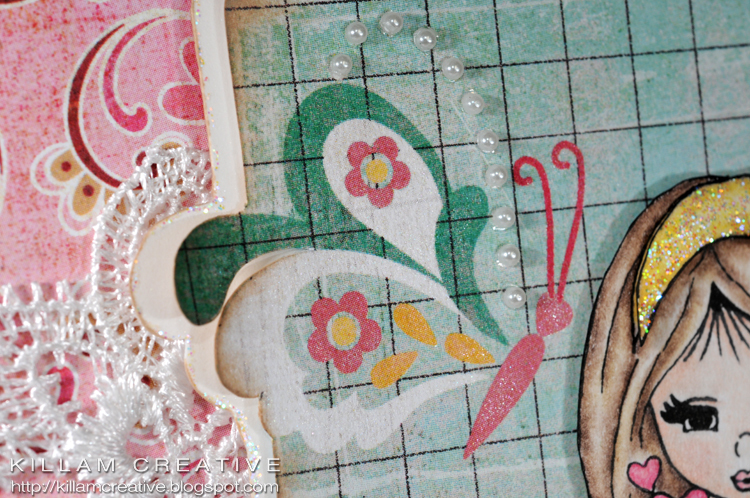 The little butterfly is cut and layered from scraps of the MLS paper. So, you know how much I LOVE my Star Dust Stickles, right? Welll, I was chatting with Kimm the other day, whining about something wanting a white Stickles without the iridescence, and she turned me on to Frosted Lace. It makes me think of a fine white Distress Stickles, if there was such a thing. I used it on the inside flower (with a touch of Star Dust in the center of the Frosted Lace), as well as on the front around Pencil Tilda's white frame. You can't really see it in the photo, but it's there! Paper: Bazzill Basics in Brown, Green and Cream; Neenah for stamps; Cosmo Cricket; My Little Shoebox "All A Flutter"
Behind the scenes: Scor-Tape adhesive in 1/8" and 1/4"
While you're looking for project inspiration this week, don't forget our Beary Sweet Challenge #2 - Fancy Folds. 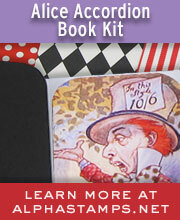 You have until May 31 to link up - you could win a Scor-Pal! *And* if you're interested in trying out Kimm's excellent mulberry tearing technique, hop on over to this Store Blog post and enter to win her Boston Kitty pattern with mulberry paper. She's so adorable! Thanks for stopping in, and I hope to see you at the challenge! The Beary Scrap Blog Candy! As you might know, our Beary Scrappy Leader Kimm makes the cutest mulberry paper "Tear Bear" acrylic patterns, and is now making a variety of fabulous animal patterns in addition to the bears. 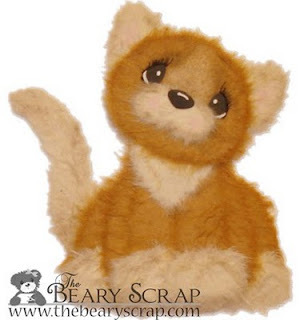 With her patterns and wonderful guidance, you can easily create precious Tear Bears and Tear Animals of your very own! Without further ado, I would like to introduce "Boston the Kitty", the newest tear critter pattern by Kimm at The Beary Scrap. Isn't she just adorable?! Kimm is offering Boston Kitty Blog Candy, including the easy-to-use acrylic pattern and mulberry paper to make a kitty of your very own! These mulberry creations are perfect on scrapbook layouts as well as greeting cards. Kimm even has a whole Tear Bear Tutorial blog devoted to helping *you* perfect your tearing skills. 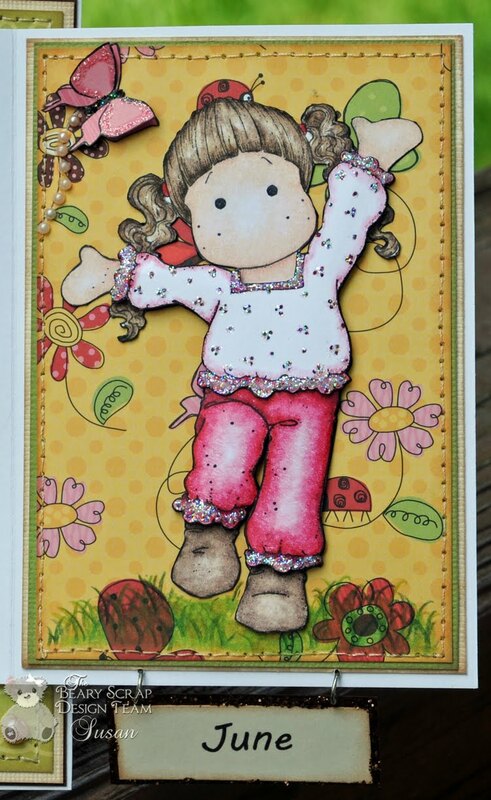 Kimm has patterns for her original bear, as well as Oliver the Dog, Bella Bunny, Charlie Chick and Emma Elephant. Boston Kitty will be released June 1, and you have the chance to win the first ever Boston pattern! Go HERE by May 31 to get all the details and enter to win. Good luck! 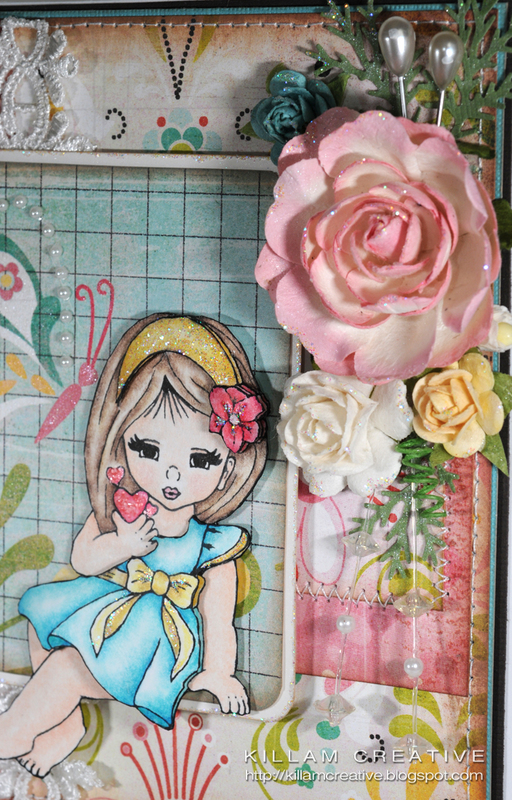 Update: the fabulous ladies over at Practical Scrappers chose this card as one of the winners for their Patterned Paper challenge. Thanks so much! What a beautiful weekend we had! We worked non-stop on the landscaping, and still have much to do. Where do all those weeds come from?! Yesterday we went to the garden center for flowering goodies and it seemed like the whole town was there, too. Yay for spring! All week the design team will show you our take on this fun challenge. We hope to see you each day for new inspiration. 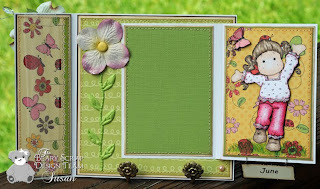 I fell in love with this folded frame technique when I saw it on Theresa Pollack's entry in our last challenge. "Hmm...", I thought to myself. "What can I do with this?" I pondered and poked and poked and pondered until I thought, "Ooh, even better... What would our dear distressing Gini do with this fancy fold?" Of course, light bulbs clicked on above my head as I channeled my "Inner-Gini". (Ok, so maybe I only distressed the flap edges and not the whole card, but I'm still claiming Gini. *grin*) She's got a really cool style and constantly inspires and challenges me. 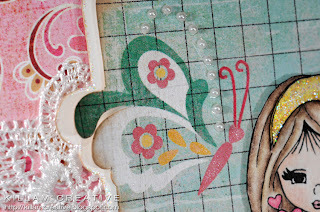 Now, before I forget or go off on a tangent, this technique can be found over at Splitcoast Stampers, an excellent resource for all kinds of new-to-me ideas. The flaps are rolled a bit to give dimension. 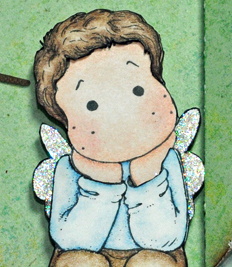 They're distressed with scissors and inked, and I'm still on the fence about using a brown Distress Ink on the edges. The dogwood branches were made some time last year for a scrapbook layout and never used. Now they finally have a home! 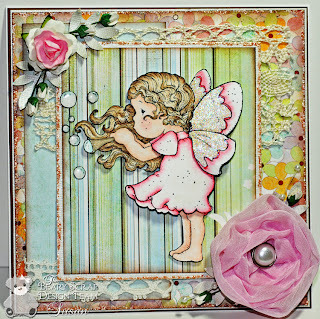 Stamptacular Sunday #59: Lovely As A Tree! 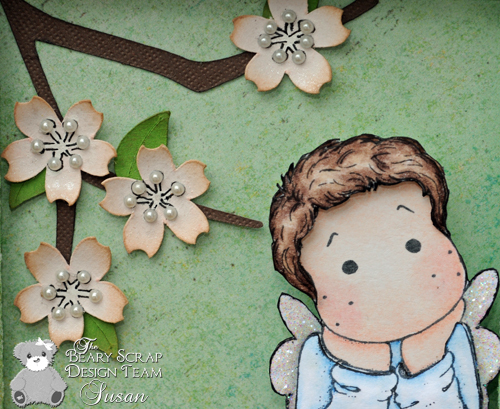 PaperPlay #19: Brown and ? Thanks so much for stopping in - I'll see you soon! It's Fancy Folds Week at TBS! Here's a peek - click the photo to see what Heartbreaker Edwin is up to; I'll be back later with all the details! Hello friends! It's been a fun year so far... I've passed my 2-year bloggy anniversary (March; although my first year+ is kind of sparse in the posting department); been lucky to be on design teams with fabby ladies; and watch my own card-making style evolve into something I really love. I've "met" countless wonderful people and I'm amazed every day to see your projects. I am inspired by *you* each and every day! Here's how you can become eligible - Please follow these requests! 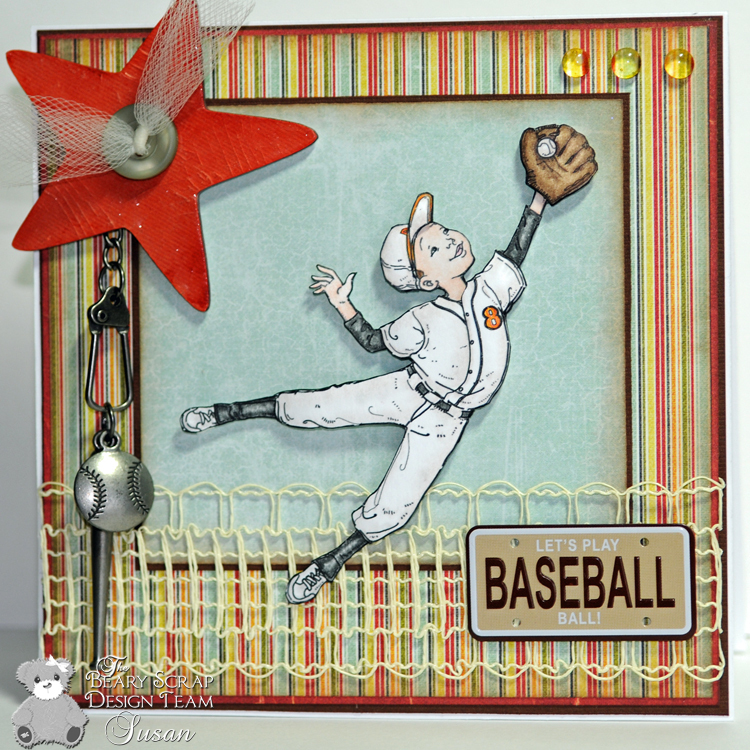 Look through my 2010 archives and tell me a card you really like (see sample entry at #1 below). So that's it. Pretty simple! This is open worldwide to everyone with blogs. I want to see you, too! Hello friends! I hope you had a lovely Mother's Day weekend. I cleared 4 yucky ant-attracting shrubs (viburnum) and countless daylilies from a flower bed that will become an herb and tomato bed. Yay! I've missed fresh herbs and home grown tomatoes and really look forward to their yumminess. This week the Beary Scrappy girls are challenged to make a project that is boy-related. Our theme is "Sticks & Stones/For The Boys". I found this "Digital Pencil, Too" image ages ago and have looked forward to using it. 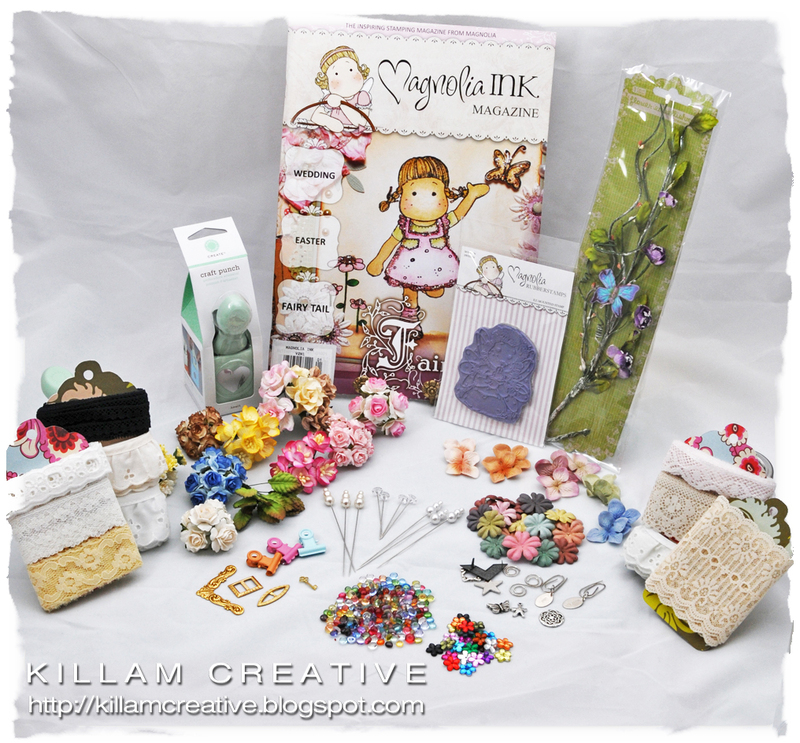 Sketch - err... it was Sketch and Stash #34. Y'know, the one that ended the day before I posted this card... duh! Hey, it was a great sketch! Well, that's it for me! 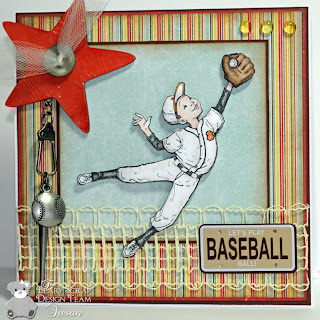 I hope you visit the Beary Scrap Design Team blog all week for more fun and fabulous creations for the boys. Don't forget that our current challenge is on until the end of the day on May 14th. 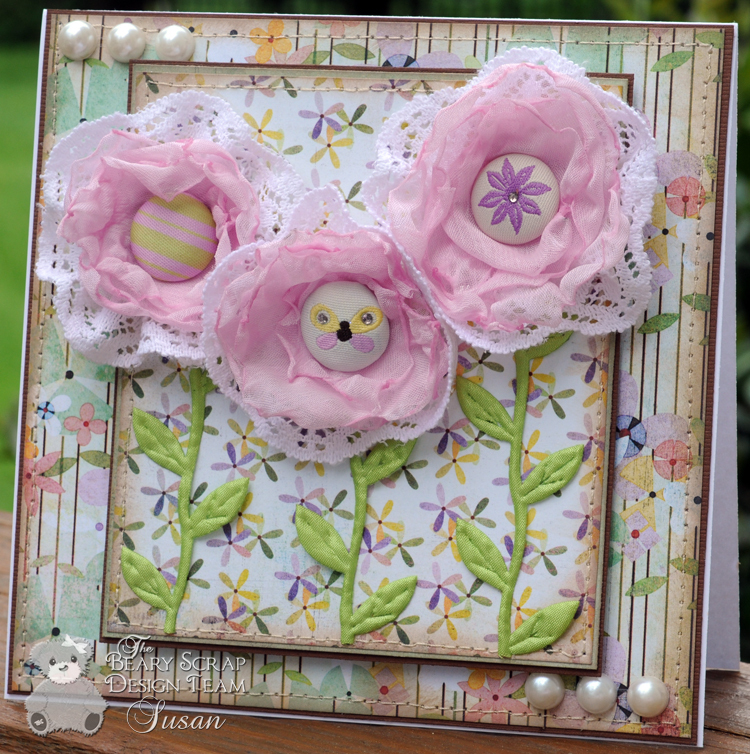 The theme is May Flowers and you can find all the details here. I hope to see you again! OH! 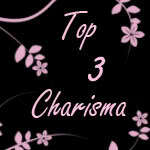 And be sure to come back here tomorrow to see my birthday blog candy! 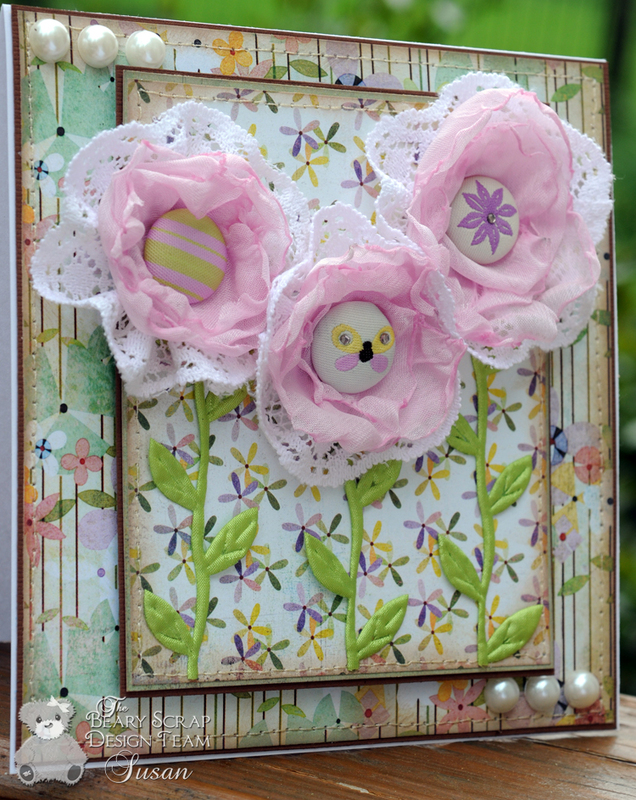 Update: I'm over the moon to announce this card won a Top 3 for the "Girly Creations" challenge at Charisma Cardz! Thank you so much ladies! Hello friends! I hope you had a wonderful weekend. My husband and I had grand plans to do loads of yard work, but went outlet shopping instead. We have just a few more weeks before tourist season hits and travel around the Delaware/Maryland peninsula becomes difficult. At least, travel to the Delaware outlets, anyway! I cut rough flower shapes from pink fluffy organza and -using tongs- hovered it over a burning candle. It doesn't take much to curl the edges, that's for sure! Luckily, I also discovered that you can snip off the burned bits and re-curl. :) Hey, I've said it before - I'm here to make the mistakes so you don't have to! 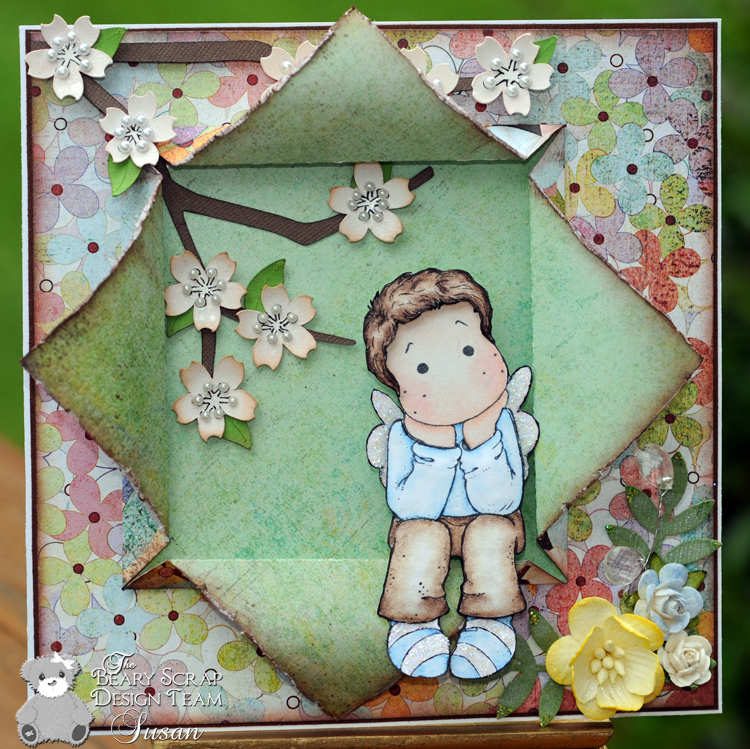 Paper - Bazzill Truffle; Basic Grey Kioshi "Lily Child" and "Motochi"
Sweet Stampin Challenge - It's Summertime! My Partner In Crafting Crime #1 - Anything Goes! 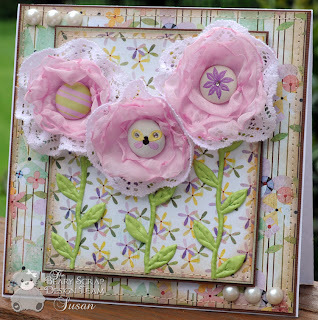 Cute Card Thursday #110 - Make Your Own! 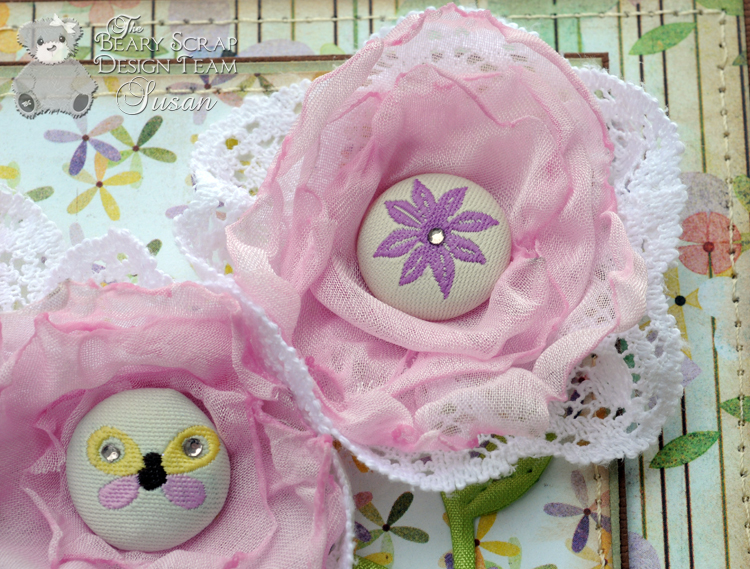 Have you seen our Beary Sweet Challenge #1? 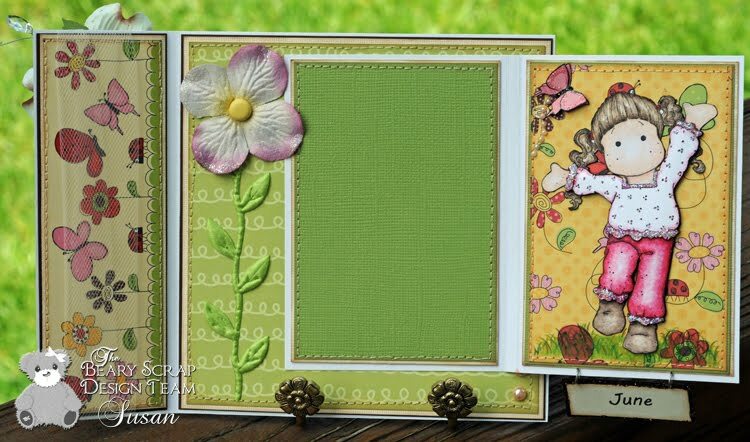 The challenge theme is "May Flowers" and all week you can view inspiration projects on our design team blog. Enter your project here any time before the end of the day on May 14th and you could win! Oh! And definitely don't forget to enter our blog candy by Wednesday, May 5th. The prize is incredible! Thanks for stopping in. 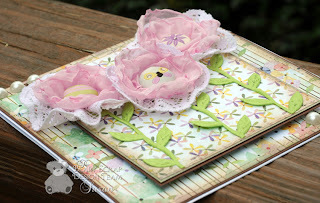 I hope you check the design team blog tomorrow to see Kimm's wonderful project! Hello friends! Today is May 1st and time for the Crafting Life's Pieces monthly sketch challenge. 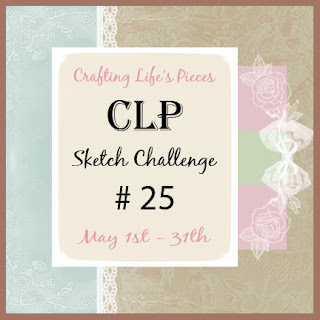 If you've read my ramblings for a while you'll know I am a huge fan of Chelsea's sketches, and I'm very pleased to be on the inaugural Crafting Life's Pieces Design Team. Whoo hoo! 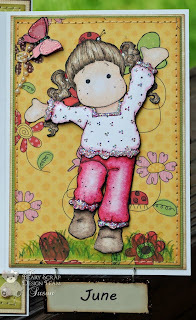 I've used one of Chelsea's Gurlee Girl stamps, called "Kisses Girl". Isn't she adorable? Here is Chelsea's wonderful sketch - please pop on over to the CLP Challenge Blog to see the other team member samples and play along! 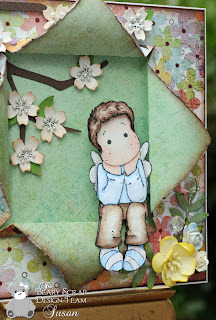 Stamp - Gurlee Girl "Kisses Girl"
Paper - Bazzill; Basic Grey Urban Prairie collection - Monarch, Bountiful; Basic Grey Bittersweet "Mousse"
Thanks so much for stopping in - you make my day!